At long last, Stefano Boeri Architects' brilliant Bosco Verticale towers are finally complete. 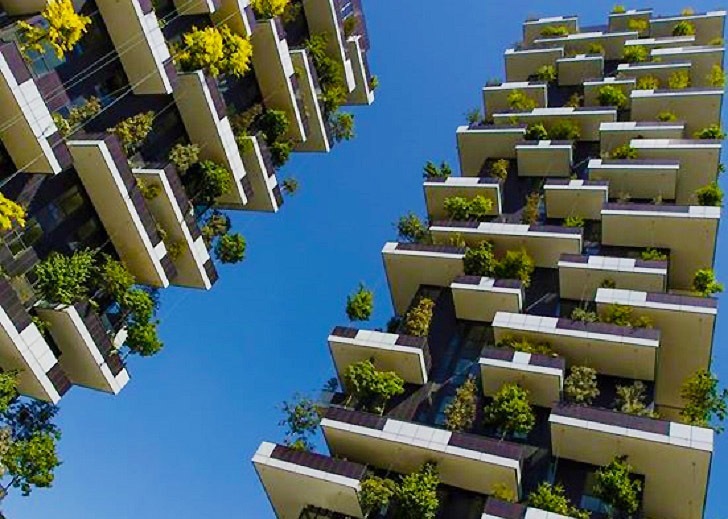 Inaugurated this past Friday, the "world's first vertical forest" comprises a fantastical pair of luxury high-rises that add nearly 2.5 acres of lush vegetation to the skyline of Milan, a city notorious for its air pollution. However, Bosco Verticale will be more than just a beautiful sight to behold--like a pair of green lungs, its forested facade of 21,000 plants will absorb CO2 and particulates, dampen noise pollution, lessen the urban heat island effect, and create oxygen and favorable microclimates. The Bosco Verticale mixed-use towers were constructed with a $2.5 billion public-private investment as part of the redevelopment of Milan’s Porta Nuova district. The towers, measuring 260 feet and 367 feet, house 800 trees between 9 and 30 feet tall, over 4,000 shrubs, and 15,000 ground cover plants including vines and perennials. 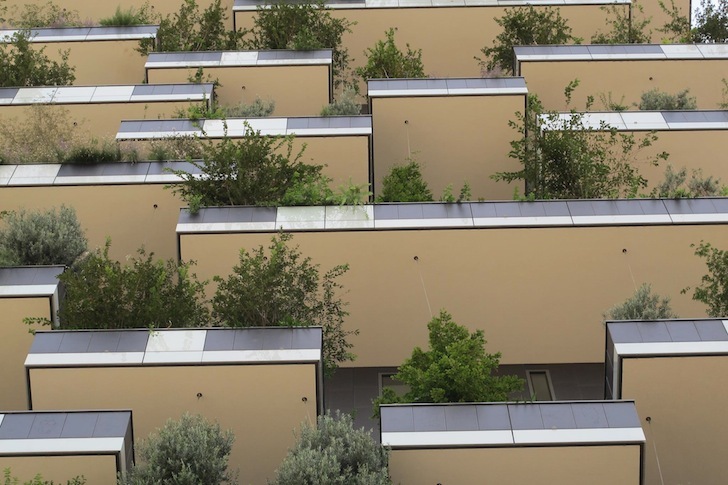 Created with LEED Gold certification in mind, Bosco Verticale is also equipped with a gray water recycling and irrigation system as well as photovoltaic solar cells. The buildings welcomed its first residents last month, but those families weren’t the only ones to call the vertical forest home; a thriving bird population has already begun to nest in Bosco Verticale’s rich foliage, of which over a hundred different species of trees and shrubs are represented. “The real key to this project is biodiversity,” says Boeri. In addition its 22,000 residences, the high-density mixed-use towers also comprise 69,000 square feet of office space and 650 commercial spaces. Nearly two out of ten property buyers are foreigners. The superstructure was also recently shortlisted for the prestigious International Highrise Building Award 2014 as one of the five most beautiful and innovative high-rises in the world that were recently completed. Boeri is currently in China, where he plans to replicate the Bosco Verticale project. 22,000 residences in two towers? They must be magic! Interesting concept, but when people start dealing with defecating birds, dead birds, etc. It wont seem so great. It looks better without the trees, so when they remove them, it wont be so bad. The Bosco Verticale mixed-use towers were constructed with a $2.5 billion public-private investment as part of the redevelopment of Milan's Porta Nuova district. The towers, measuring 260 feet and 367 feet, house 800 trees between 9 and 30 feet tall, over 4,000 shrubs, and 15,000 ground cover plants including vines and perennials. Created with LEED Gold certification in mind, Bosco Verticale is also equipped with a gray water recycling and irrigation system as well as photovoltaic solar cells. 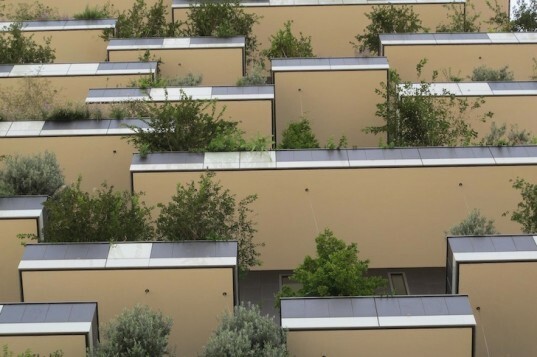 A thriving bird population has already begun to nest in Bosco Verticale's rich foliage. Over a hundred different species of trees and shrubs are represented. In addition its 22,000 residences, the high-density mixed-use towers also comprise 69,000 square feet of office space and 650 commercial spaces. The superstructure was also recently shortlisted for the prestigious International Highrise Building Award 2014 as one of the five most beautiful and innovative high-rises in the world that were recently completed. Boeri is currently in China, where he plans to replicate the Bosco Verticale project.